KNOW YOUR TECH breaks down the scientific technology used in your favorite sneakers and activewear. Let’s demystify your next purchase: today’s technology is Brooks BioMoGo midsole. This innovative compound is part of the brands&apos; effort to become a sustainable company and offer eco-friendly alternatives to traditional sneaker components. What is it? The world&apos;s first fully biodegradable midsole foam. An enhanced version of Brook&apos;s MoGo midsole, BioMoGo has been rigorously tested to ensure that it offers the same performance and cushioning as standard a MoGo midsole. 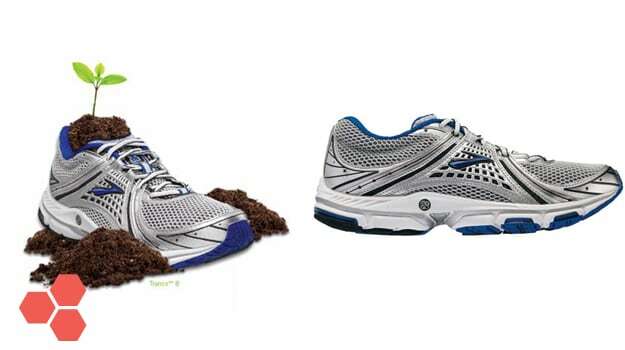 The BioMoGo technology works by breaking down 50 times faster than standard foam midsoles in active landfills. How does it work? While standard EVA midsoles can last up to 1,000 years in landfills, BioMoGo is engineered to break down and convert to useful humus 50 times faster. Over a 20-year period, BioMoGo technology will save more than 30 million pounds of landfill waste, enough to stretch 1,200 football fields. By altering the makeup of the midsole, Brooks is doing a huge part to change the environment. Bottom line: Sneakers may not be the first thing that comes to mind when you think about green alternatives, but something as simple as a different midsole can make for a major impact.